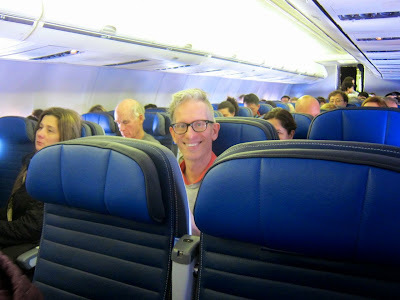 male pattern boldness: Home Again and Getting Organized! It's always fun to go on an adventure and what better place than the Costa Rican rainforest? 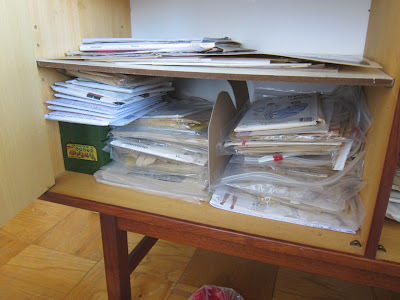 Back home and feeling refreshed, I want to get better organized before taking on another sewing project. 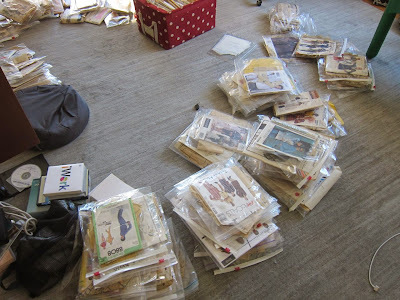 First to be tackled: my pattern stash. I'd say I own roughly 500 patterns and I don't anticipate owning too many more at one time as I just don't have the space. 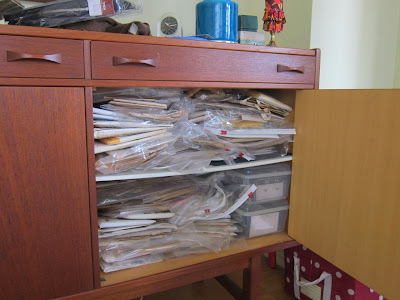 I've generally stuffed most of my patterns into shelves in my living room credenza: men's patterns in the left cabinet and women's on the right. Unfortunately, there's also a center cabinet, and here's where things get messy and confusing. I've been tossing anything that couldn't fit in the other two cabinets there. In addition, I own two fabric boxes with zippered tops that hold even more of the overflow (though one is primarily men's patterns that are sizes other than my own). There is a method to my madness: I archive my patterns in two Picasa files: my men's patterns here and my women's patterns here. They're basically organized in chronological order, with a pic of the finished project if I used the pattern. I try to keep this up to date, though sometimes I fall behind. Today, I emptied everything out and sorted through it. I organized my men's patterns by garment type: shirts, pants, jackets, underwear/bathing suits, etc. 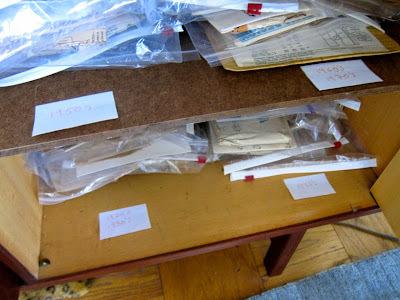 I sorted my women's patterns by period: 20's, 30's, 40's, and so on. I'm not sewing many women's patterns these days so quick access isn't so important. 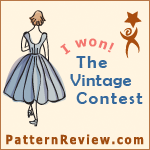 But I do want a general idea of where to find, say, a 1950's cocktail dress pattern. Since my Vogue Paris and other designer originals are larger than my other patterns, I put them in a fabric box of their own, which they share with doll clothes patterns and costume patterns. I know some of you have come up with amazingly sophisticated systems to organize your patterns, but I need something simple; most of the time I'm using the same 10-15 patterns anyway and I don't mind taking out a stack to find the one I need. 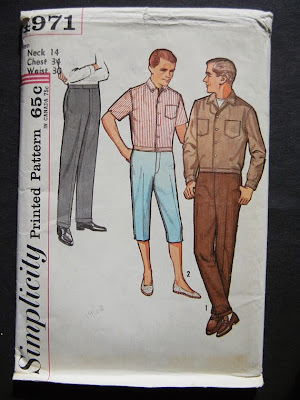 Speaking of patterns, I purchased a men's 1960's pants pattern on Etsy the other day: Simplicity 4971. I really like the idea of making a pair of slim trousers with a slightly higher-than-usual rise, like the gray pair on the left. Today I also dropped a large bag off at the Salvation Army filled with everything from picture frames to hats to CD's (and yes, there are some patterns in there as well). It feels so good to de-clutter and there's always more where that came from. And that's it! I hope you've had a productive week and look forward to sharing my February projects with you. Welcome back! Sounds like you guys had a marvelous time & missed some nasty weather here in the US. 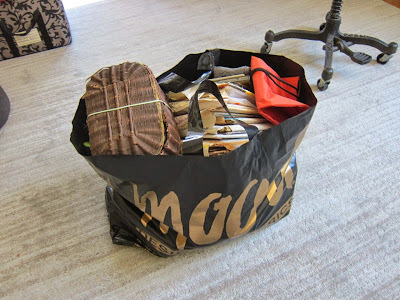 I love when you talk about getting rid of things almost as much as your sewing; you're always inspiring me! 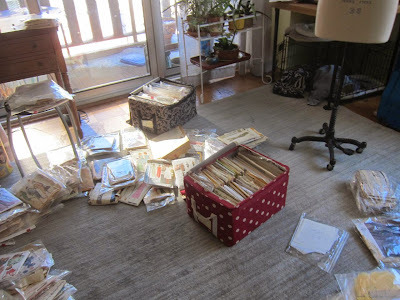 Gee, I feel refreshed just reading about your return and that almost exhilarating feel of reordering your pattern stash. Welcome back (and belated good wishes on the impressive 5th birthday of MPB). Do you have pictures of your self made wardrobe in sunny Costa Rica? Where did you go in Costa Rica, Peter? My husband grew up there and I am always curious about where people go and their impressions of where they stayed. He grew up in the mountains above San Jose near Heredia. We were in Las Horquetas in the Sarapiqui region, which is in the province of Heredia.. 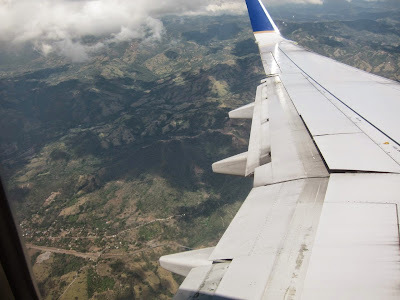 I've always wanted to go to Costa Rica. Welcome back! I've been slowly acquiring patterns and wondering how to organize the growing stash. Even how to store them (as in what type of container) is a question. I like the idea of zippered nylon rectangular totes: stackable and portable, light, strong, accessible. As for patterns whose sizes aren't your own, what method do you find works best for re-sizing a pattern? Welcome back. Missed my MPB fix. sounds like you had a great time. so what is next .. when is your fall 2015 menswear collection coming .. ???? Great to have a vacation and escape the blizzard! 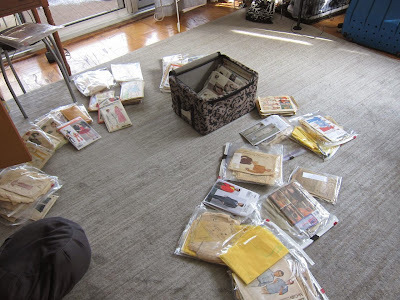 I culled my pattern stash when I moved into a much smaller apartment. I only miss 1 or 2!! But now I can freely purchase more. I take the pattern envelopes and cut them flat and put them in clear plastic sleeves in a notebook by garment type. 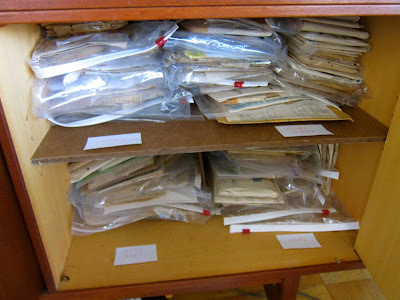 The "guts" go into a ziplock and are filed by number in bins. I'm down to only 2 bins. Can you believe that? Wow, you both look so joyful in the photo, hope you have wonderful and restful holiday! Well done on organising your patterns, looks like it was challenging to say the least. But at least it's done for now! 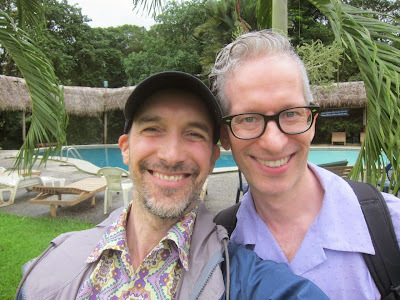 You both look great in the vacation photos and what a beautiful place Costa Rica is! Good to have you back! Vacation! Yea! Your timing was excellent! Your system is as good as any. I poke through mine about twice a year and resort them as my needs and tastes change. And I do prune and donate (cause I have to take some patterns to the thrift store to account for the ones I've bought there - refill the karma bin?) Need to pick up more comic book bags and another storage box for deep storage. How great that you went to a warm, beautiful place, but glad you’re back! As usual, your efforts inspire me to declutter. Im really jealous about all the mens pattern and pattern you have .Here In Germany we only have a fes Men Pattern from Burda and I have to buy most of Men Pattern in the US !! I commend you for decluttering. It's something I most definitely need to do!